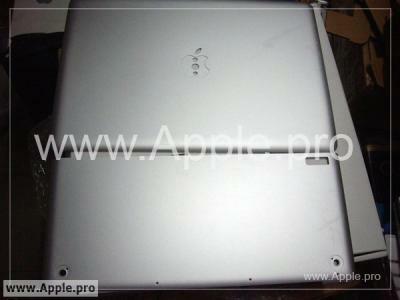 AppleInsider reports that the leaked MacBook Pro case photo published over the weekend is, in fact, legitimate. Although the enclosure shown in the photo appears to be a slightly dated prototype that has somehow found its way into the wild, casings currently sitting in Apple's labs are said to be nearly identical, as the overall design has not changed. 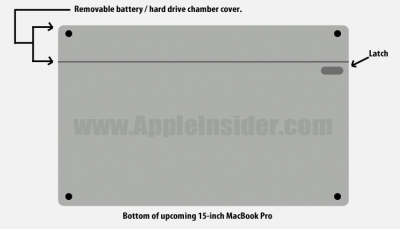 According to their sources, the battery will take up the the remainder of the bottom casing and the rectangular recess is a latch to release the battery. Taking up 25% of the bottom of the case, the battery compartment will also provide easy access to its hard drive. AppleInsider also speculates (not confirmed) that the Apple logo will continue to be illuminated from behind as it is in existing Apple laptops. Update: A time lapse video showing the complicated procedure of how to replace a hard drive in the current MacBook Pro.